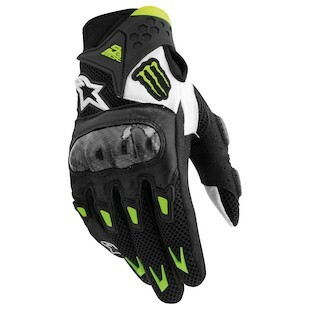 Alpinestars Monster Energy Gloves are "so" better than Red Bull gloves. You know this! Go tell your mom. 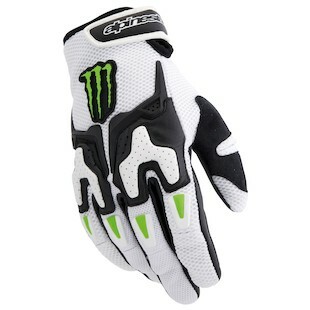 The Alpinestars GP-M Gloves are essentially GP Pros with the addition of the Monster logo. The new features for this year's GP Pro update include ventilation via an abrasion resistant backhand vent. Also, Alpinestars patented racing finger bridge was added, keeping the little finger in place and eliminating abrasion of finger seams. Lastly, you may notice new L-shaped PU sliders that feature better impact and abrasion resistance. The GP-M gloves will be available in black/green and black/white/green. The Alpinestars M1 gloves, the ultimate in urban styling, are the S1 glove with the addition of the monster logo. Like the S1, the gloves have external side wrist protectors and little finger reinforcement for abrasion resistance. They are anatomically designed with pre-curved fingers to assist with grip and reduce muscle fatigue. Not only does the palm has superior grip and feel, the thumb and finger are also reinforced with Clarino and use external stitching to improve the feel and comfort. The Alpinestars M10 Air Carbon Gloves are definitely motocross inspired. With carbon protection, they are the original SMX 2 Air Carbon gloves with (of course!) all the Monster DNA added. The combination of leather and a mesh upper, offers durability, abrasion resistance, and comfort. The Carbon fiber knuckles are a great protective feature as well adding a bit of flash to this sub-$80 mesh glove. 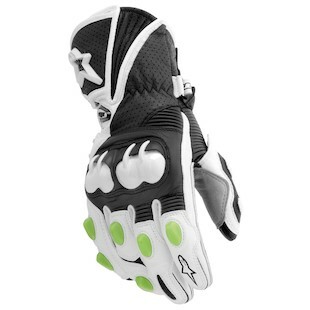 The M10 Air Carbon comes in black/green and black/white/green. Originally the SMX 3 glove (before the Monster transformation! ), the Alpinestars M20 Air Gloves use goat skin leather with a mesh upper construction for superior comfort, flexibility and feel. The knuckles have EVA foam while the palm uses suede micro-fiber. 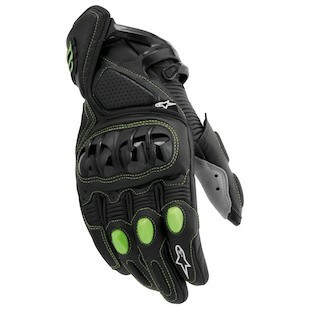 The M20 Air gloves are available in black/green and black/white/green. Don't miss the rest of the new lineup of Alpinestars Gear, available at Revzilla.com.